King County farmlands, forests, shorelines, trails, urban green space and natural areas are a target of a conservation initiative by the county executive. Verdant farmlands with strolling cows, lush forests and fragile shorelines, even bits of green in the gray of the city: These are some of the last best places in King County. All would be protected forever from development under a King County conservation initiative that would buy 65,000 acres of open space targeted for acquisition over the next 30 years. The initiative, expected to be announced by King County Executive Dow Constantine on Wednesday at a news conference, will go to the Metropolitan King County Council for consideration Thursday. Constantine will introduce legislation that would allow King County to sell more bonds backed by the existing Conservation Futures tax, providing an ongoing source of revenue for conservation acquisitions. Over the next four years, the ordinance would generate $148 million to save open space most at risk of development. “This is one of those opportunities to do something really lasting that will benefit this place forever,” Constantine said. The conservation initiative would preserve a wide range of landscapes, including 26,500 acres of forests in the Cascade foothills and rural areas, 2,400 acres of urban green space, 125 miles of trails to connect regional trail networks, 13,500 acres of farmland and community gardens to promote and protect local food production and 20,600 acres of natural areas, including river corridors and habitat for wildlife and recreation. The initiative builds on earlier conservation efforts by the county working with other partners to preserve more than 110,000 acres of open space. The anchor funding for those acquisitions is a property tax under the Conservation Futures Program, created in 1982 in King County through provisions established under state law. The ordinance Constantine is seeking would allow the county to sell bonds based on 80 percent of the funds raised through the tax, rather than 50 percent, creating a bigger revenue stream more quickly for conservation purchases. 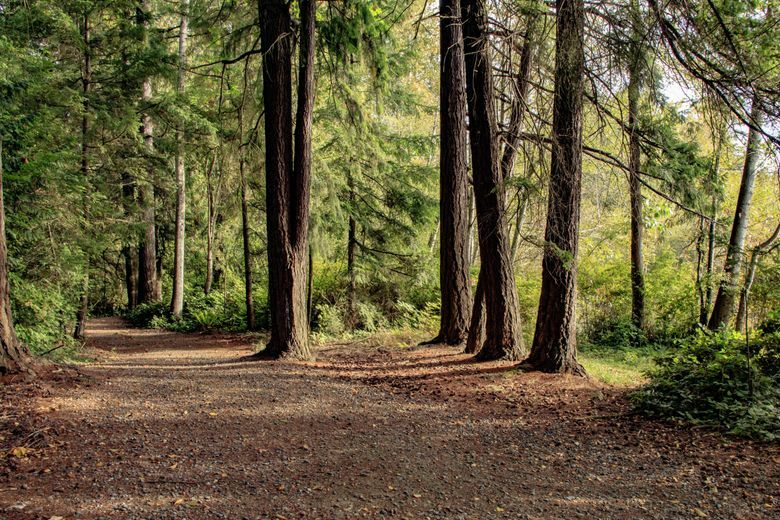 • Lakeshore forests and trails enjoyed by the public for 50 years at the Weyerhaeuser Campus in Federal Way, sold by the company in 2016 to Wesco, a Los Angeles-based realty group. • A half acre of grass and trees in Tukwila for kids living in apartments with no place to play. • Right of way to complete the Eastside Rail Corridor through Renton, Bellevue, Kirkland, Woodinville and Redmond. • Woods adjacent to the Tomanamus Forest, 96,307 acres of forest in King, Pierce and Lewis counties purchased by the Muckleshoot Indian Tribe in 2013. The King County acquisition would provide permanent connectivity for wildlife from the forest to woods in the foothills in Enumclaw. • Conservation easements on 14,000 acres to protect a working dairy farm in Enumclaw. Constantine said there is an urgent need to step up the pace of conservation in the county, before land values drive prices even higher and some properties are lost. The ordinance also would eliminate financial-match requirements for acquiring open space in communities where that is an obstacle to working with the county to save properties. “We want to preserve the wilderness, the farmlands and the trail corridors. But we also need to be mindful of creating accessible open space — green space — where people live,” Constantine said. A new cabinet of advisers would work with an existing citizen-oversight committee guiding investment to make sure benefits reach disadvantaged communities in the path of explosive growth regardless of ability to come up with matching funds. Constantine said the Land Conservation Initiative came out of two years of study and discussion to better position the county and its future quality of life in the face of growth at a record pace. It was conservation that first got Constantine into politics 30 years ago, working with neighborhood activists while he was still in school to preserve a lush, green ravine near his home. Today that ravine is the College Street Ravine Park in the Duwamish Head Greenbelt. “Here I am 30 years later, still trying to finish the job.